Following two days of executive meetings, Day one of the Open Conference welcomed members, associates and guests to the Ritz- Carlton, Doha. Incoming President Peter Pond of Australia gave a tribute to outgoing President Dr. Hans R Nagel, who had been awarded the honorary title of President Emeritus and presented with the gift of a commissioned watercolor painting of his horse, Hanan, by Peter Upton. A video tribute was presented by Monika Savier. 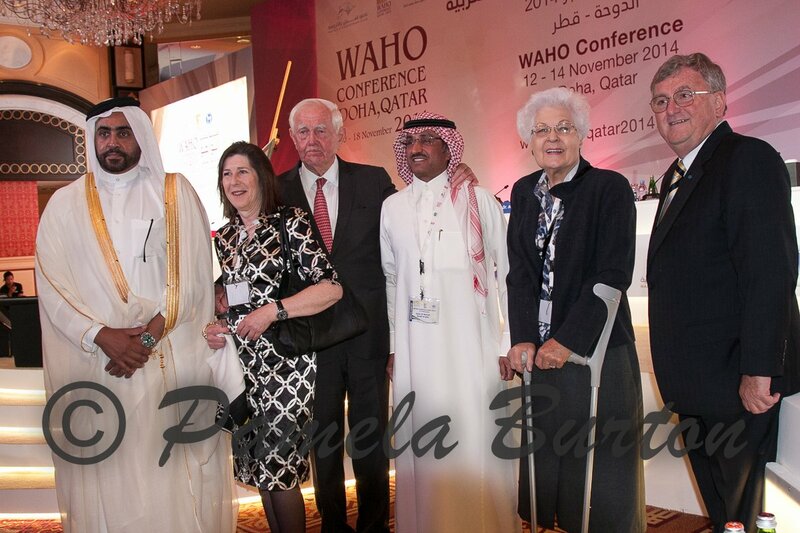 President Pond then welcomed 64 Members and two Associate members to WAHO Qatar 2014. The newest accepted members are Serbia and Ecuador. Cuba and The Republic of Yeman were acknowledged as Applying members. Cynthia Culbertson, noted historian on Arabian horse history, gave a video presentation on the Bedouin cultural connection to the Arabian horse. Mrs. Culbertson detailed how rock art dated 2300 years ago depicts what might be the Arabian horse with arched neck and high tail carriage. Unlike camels that were used for everything including transport, the Arabian horse was a luxury for the Bedouin. Culbertson noted that the Arabian horse often lived in the tents and was integrated as part of the desert family. She noted that the Arabian horse did not make its way to Europe until the 1500’s. Day two saw more housekeeping – reconfirmation of the purpose of WAHO and a reminder of a small raise in WAHO dues. A report was given by each of the Member countries on the number of new Arabian foals registered in 2013. Estimated sum numbers: The USA tops the list of pure-bred Arabians with a registration number of 3,782 with export of 510 and import of 61 horses. France is number two in numbers with 1,225 registered Arabians and 356/325 exports/imports, while Egypt is a close third with 1,162 registered Arabians and exports/imports of 119/147. Two speakers sponsored by the Qatar National Research Fund participated in the afternoon agenda. Poland’s Professor Tadeusz Majda gave a slide show presentation regarding The Count Rzewuski Manuscript, a large volume of diary papers by one of the original adventurers who had traveled from the Russian steppes south to the Levant and the Arabian Peninsula in a quest for the pure-bred Arabian horse. These horses were known to give a cavalry an enormous military advantage. Originally scripted in old French, the volumes detail the Count’s travels in Arabia to find and import Arabian horses. The manuscript now resides at the National Museum of Warsaw and it has become a quest to translate these works into Arabic and English, funded by the Qatar Foundation. This complex task is expected to take several years, according to Mrs. Izabella Pawelec-Zawadzka, retired breeding inspector of the Horse Breeding Department of the State Stud Farm in Poland. Excerpt from The Polish Quest For Arabian Horses by Peter Harrigan for Saudi Armco World Magazine (Vol 52, No. 6 (†): Pure-bred horses from the Arabian Peninsula, known then as today as kuhailans, were renowned as light and swift, with even temperament and enormous endurance under the harshest conditions. Moreover, because they developed as a singular breed, they were famed for the uniquely consistent, predictable way in which they passed on their qualities to successive generations. 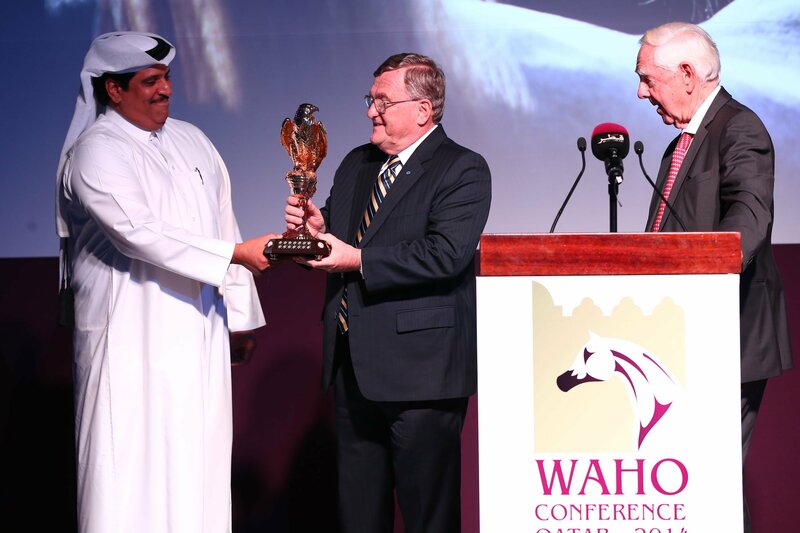 Cornell’s Professor Douglas Antczak continued a theme introduced at the 2011 WAHO Conference in Qatar regarding genetics in horses. The 2011 report by Professor Antczak and Dr. Samantha Brooks highlighted research by the Baker Institute for Animal Health on the Lavender Foal Syndrome (LFS) and was funded in part by the Arabian Horse Foundation. Professor Antczak and a team of scientists from all over the world are now collecting DNA samples of different horse types. They have identified the full complement of 22,000 distinct genes in the horse and developed tests that can be used to determine the relationship between different horse breeds. Thus far the Arabian seems to be most closely related in the equestrian world to the Akhal Teke horse from Turkmenistan. The proposed study will seek genetic markers that can distinguish lineages and families of Arabian horses, and horses used for different purposes, such as racing or endurance competitions. This study of genetics will also improve the welfare of the horse by identifying genes that contribute to survival in harsh environments such as the desert areas where the Arabian horse developed and flourished. The members adjourned to the Qatar Racing and Equestrian Club for top racing including four Arabian races. Day three included member housekeeping, rules and changes, and reserved the remainder of the day for guest speakers. Prior to lunch, Dr. Jean-Louis Leclerc, veterinarian and retired French National Endurance coach, gave a well received slide presentation on “Improving the welfare of endurance horses in training and competition.” As one of the most successful National coaches and a member of the FEI Endurance Strategic Planning Group (SPG) for the welfare of the horse, Dr. Leclerc explained the momentum that has taken the sport of endurance from an amateur passion to a professional level, and he defined ways to bring the sport back inline with the original goals. The SPG had been tasked by the FEI Bureau to develop a strategic plan for the sport for the next decade and a series of recommendations for a permanent solution to the issues within the sport, particularly those related to the increased levels of positive drug testing and high numbers of injuries and fatalities. Dr. Leclerc’s full comments will be explored in a broader report. 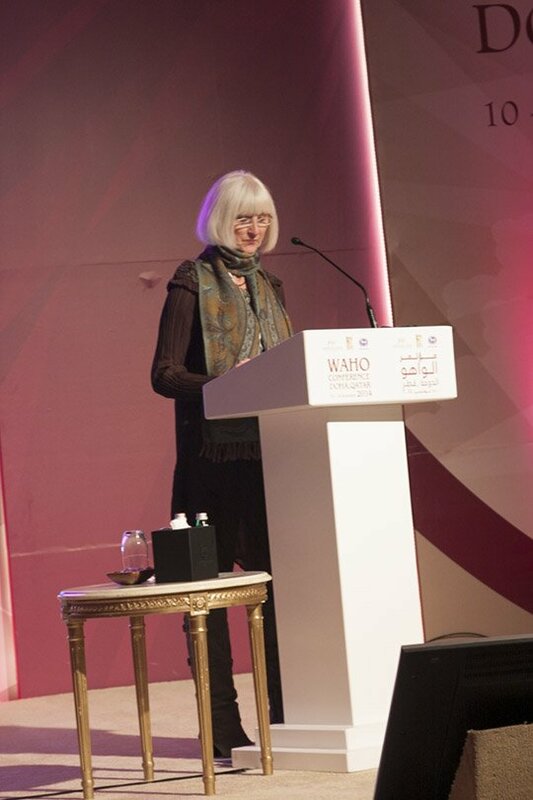 Conference coordinator Hannie Maasdijk said she was happy to welcome 200 attendees from around the globe to WAHO Qatar 2014. 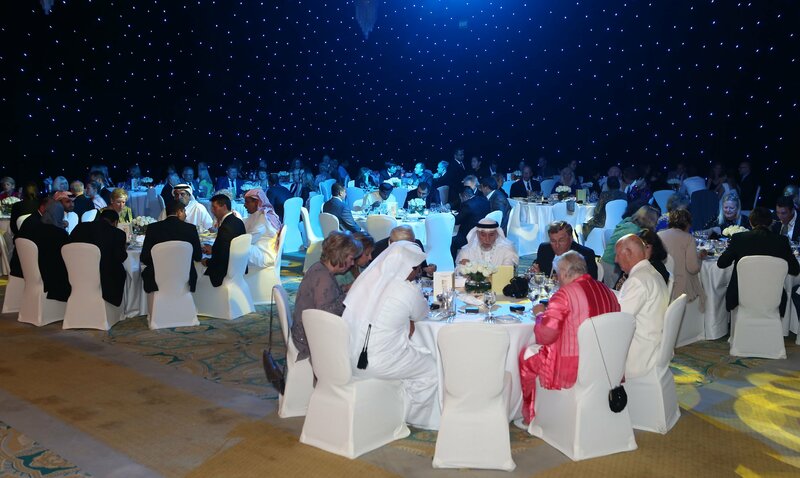 The Conference was concluded at a Gala Dinner at the Four Seasons Hotel hosted by the Qatar Racing and Equestrian Club (QREC). QREC General Manager Sami Al Boenain gives Peter Pond a thank you as Dr. Hans Nagel looks on. WAHO has the responsibility of ensuring that standards acceptable to all of its Registering Authority Members are established and maintained in the matters of regulations, methods of registration, and production of Stud Books. A conference has been held every second year since 1970. WAHO has 64 Members and Applying Member nations, with an additional 19 countries whose Arabian horses are registered by neighboring countries. 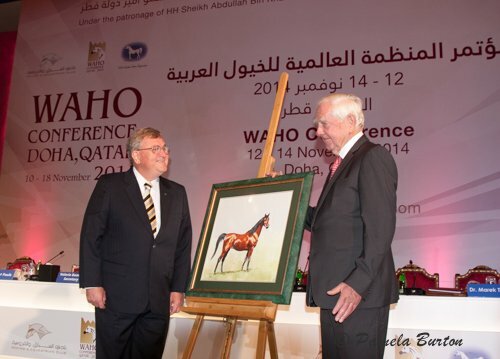 The 2013 conference in Brazil was cancelled, but 2011 host, the Qatar Racing & Equestrian Club, stepped in to host WAHO again in 2014. WAHO has always acknowledged that the Middle East countries are the homeland of the Arabian horse and has accepted desert-bred Arabians without a western-style 5-generation pedigree into the WAHO Definition ever since the positive vote of the Registering Authority Members at the General Assembly held in Calgary in 1982. 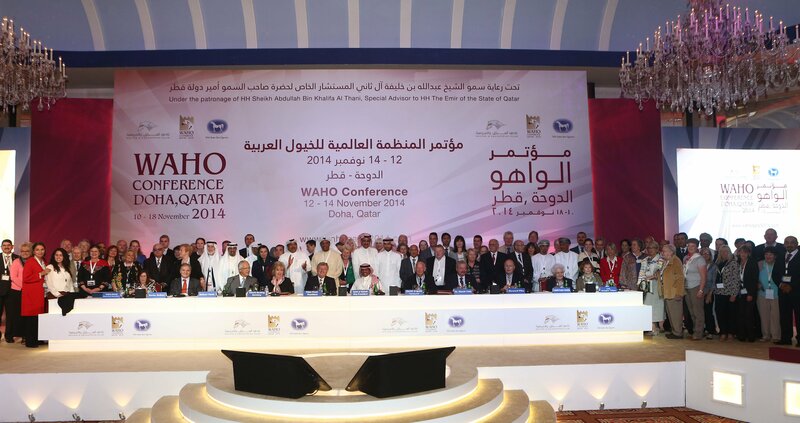 At the 1998 WAHO Conference in Bahrain, the Delegates voted unanimously to re-confirm the WAHO Definition and make its application mandatory. 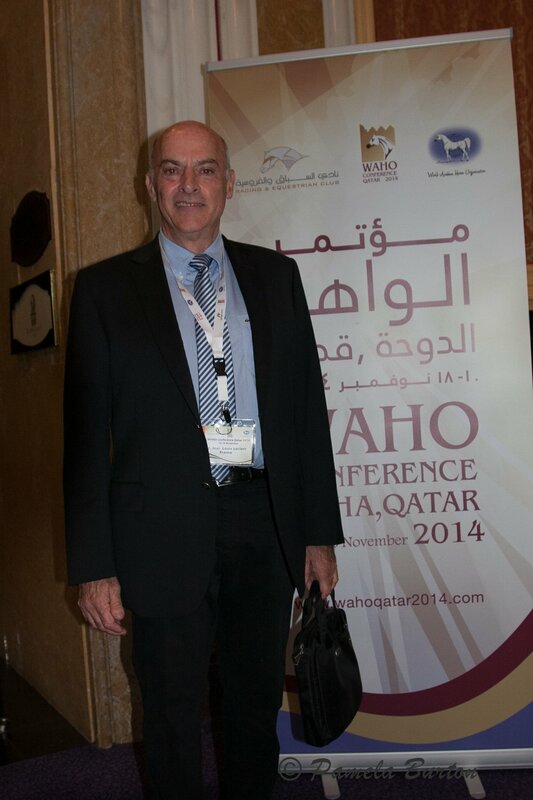 Since that 1998 Conference, it is a mandatory rule that a horse entered in a stud book or registry for pure-bred Arabian horses be fully accepted by WAHO and must be acceptable as pure-bred to the Registration Authorities of all WAHO Members and must not be rejected on a pedigree basis. At the 2004 WAHO Conference in Poland, the Delegates passed a majority vote to close the world Arabian Stud Books to horses which do not trace on every line to horses previously registered in a WAHO approved Stud Book. At the 2007 Conference in Damascus, Syria, the Delegates voted to make the WAHO Rules for Registration mandatory. (†)This article appeared on pages 6-15 of the November/December 2001 print edition of Saudi Aramco World.